This perfectly striped romper is a throwback for us here at Adorable's! This new to us brand, Noruk, has fun, playful styles that take her from day to evening in the most colorful and comfortable ensembles! 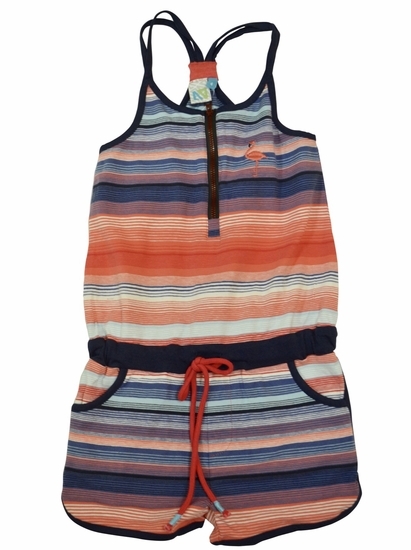 This adorable coral and navy striped cotton knit ombre romper is a must have for spring. The colors are gorgeous and the bodice is accented with an embroidered flamingo at the chest. The racer back keeps her cool in the warmer weather and the shorts have real working pockets! Get your Noruk Stripe romper in sizes from 6-12. Your Adorable's order ships free with any order over $75 in the US! Runs true to size! Feel free to call 877-767-8579 or email us at sales@adorableschildren.com for specific sizing measurements!